Focal. Depigmentation is limited to one or a few areas of your body. Segmental. Loss of skin color occurs on only one side of your body. Generalized. Pigment loss is widespread across many parts your body. Although it can start at any age, vitiligo often first appears between the ages of 20 and 30. The white patches may begin on your face above your eyes or on your neck, armpits, elbows, genitalia, hands or knees. They're often symmetrical and can spread over your entire body. The disorder affects both sexes and all races equally. 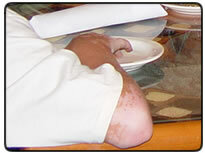 Most people with vitiligo are otherwise healthy and have normal skin texture and sensation. However, the condition may be more common in people with certain autoimmune diseases - diseases in which your immune system reacts against your body's own organs or tissues - such as Addison's disease, vitamin B-12 deficiency anemia (pernicious anemia), or thyroid disorders, including hyperthyroidism and hypothyroidism. The natural course of vitiligo is difficult to predict. Sometimes the patches stop forming without treatment. In other cases, pigment loss can involve most of the surface of your skin.